Here is a graph produced by one of the world’s largest carpet manufacturers showing the difference between. 1. Neglected Carpet, you can see the carpets appearance level will drop off dramatically, causing you to buy new carpet prematurely. 2. Un-planned maintenance, this is where most people fall into. Every three or four years they get the carpet cleaned, this is better than never cleaning them, but by the time you call there is so much damage to the carpet fibres that it is a battle to restore them. 3. 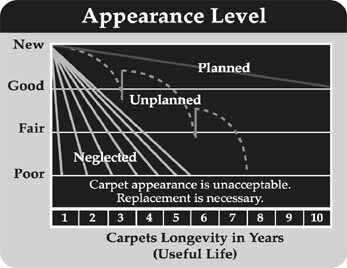 Planned maintenance, this is the best way to prolong the life of your carpets and keep you and your family healthy. When you have twice yearly or at least annual cleans your carpets will remain looking like new for far longer, they will be healthy and so will the people living there.